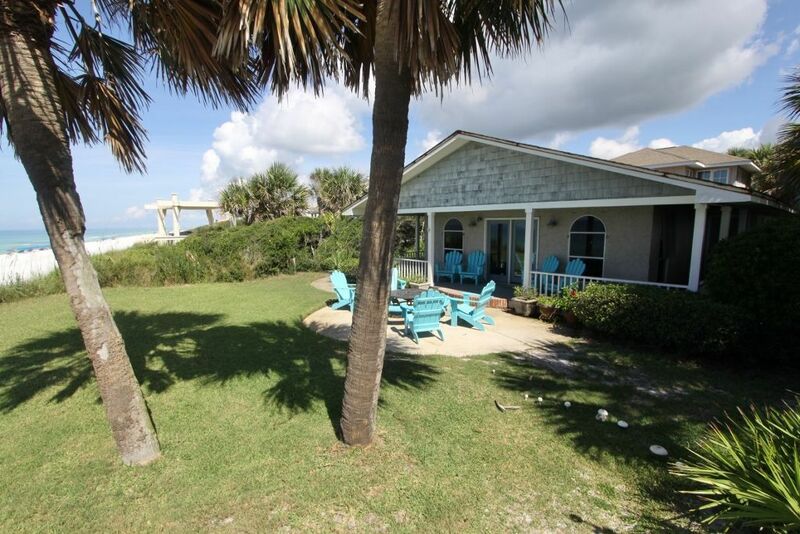 Sea Turtle Cottage, Newly Renovated Gulf Front near Seaside! Stay with Sunburst and get up to $280 in Beach Gear delivered to your vacation home! Sea Turtle Cottage, renovated and re-furnished in 2013 and again in 2015, is a 2570 square foot Gulf Front vacation rental home in Seagrove Beach that has 5 bedrooms and 4 baths and sleeps up to 12. Directly on the Gulf, enjoy the grassy yard and patio outfitted with ample Adirondack chairs and outdoor fire pit. This home also has a private boardwalk to the beach. Wireless internet. First Floor: The majority of the home is on the entry floor. The living room overlooks the gulf and has brick flooring, sectional sofa, additional sofa, 3 side chairs, coffee table, LCD TV and Blu-ray over the wood burning fireplace, stereo with Ipod dock and a lamp. The dining table has 6 chairs and a long bench for can be pulled in for a total of 10 persons. The adjacent kitchen has just been upgraded with granite countertops and a center island with barstool seating for four. It is outfitted with a Samsung stainless dishwasher, stainless French door frig with door ice / water dispenser, separate ice maker, glass top range with microwave above and ample cabinet / pantry space for grocery storage. Off the living room is the first of 3 king master suites – this one is outfitted with parquet tiled wood floors, king bed, 2 bedside tables, 2 lamps, dresser, LCD TV, bench seat, closet and private bath with vanity sink and tub/shower. Off this bathroom is a door to one of the outdoor hot/cold showers. There is a hall bath off the kitchen as well which serves the king and bunk rooms on this floor, both of which have hardwood floors. This bath has a vanity sink, tub/shower and door to the other outside shower. The bunk room is down the hall and has 2 built-in bunks (4 twins), dresser, lamp, LCD TV/DVD and closet. Also off the hallway is another king bedroom with one bedside table, two lamps, dresser, LCD TV and closet. Second Floor: There are 2 king master suites up on this floor – a bit removed the remainder the house making these rooms more private and quiet for their occupants. The first suite offers a king bed, 2 bedside tables, 2 lamps, LCD TV, dresser, side chair, closet and private bath with vanity sink and tub/shower. The second suite offers a king bed, 2 bedside tables, 2 lamps, dresser, LCD TV, DVD player, side chair and private bath with vanity sink, tub/shower and the second washer/dryer set. Garage and Outside: One car garage has one of the two washer/dryers in it. Garage also has a second frig. Charcoal grill. On the gulf front, there are 8 Adirondack chairs and a fire pit with a circle of benches around it. Grass lawn on the gulf front is perfect for the little ones. Two outside hot/cold showers. Parking for 3 to 4 cars in driveway / garage. Private beach walkover. There is a neighborhood easement on the East side of the property – just a few homes use this path to the beach. Sunburst Beach Vacations offers accommodations that include Gulf front beach homes, condominiums and Gulf view villas with private pools. We specialize within several unique beach communities along Scenic 30A like Seaside, Seagrove Beach, Grayton Beach, WaterColor, WaterSound and Rosemary Beach. We are a small, locally-owned company with intimate knowledge of our area, and we can provide professional, friendly advice to create the perfect beach vacation to fit your needs. We look forward to working with you…please give us a call today! IMPORTANT NOTE: Regarding pricing, a cleaning and processing fee, a $69 Vacation Rental Damage Plan Fee and tax will be added to ALL rates. Travel Insurance is optional and can be added at Guest's choosing. Great location! Really nice kitchen and kids loved having a yard overlooking beach. Fewer stairs to beach than many locations. Two of the four king beds really need new mattresses. We had an insect problem. As soon as we called about it we got a very quick response even though it was Sunday. However it dampened our comfort in the house and we then still kept seeing dead bugs and a few more crawling. If these two issues could be taken care of would have greatly improved our experience. Just steps down to beach, amazing views. Loved that living space was all on first floor. Kitchen had just about everything needed. Restaurants and stores close by. 5 minutes drive. Loved outdoor shower off main bedroom. Only down side lots of ant hills in grass area. Thank you for sharing your experience in "Sea Turtle Cottage". We are delighted that you enjoyed your stay and we hope we may host you again! The Sea Turtle Cottage was wonderful. You can not beat the close proximity to the beach. Our children, spouses, and 5 grandchildren loved it. The grassy area was great for the little ones, and the adults loved sitting in the adirondack chairs in the evening. The house was very nice - very well furnished and offered many amenities we liked - well-equipped kitchen, 2 washer/dryers, 2 refrigerators, and large beds. Although there is a tv in every bedroom and one in the den, we were on a tv holiday - highly recommended for a good family vacation! I would not hesitate recommending the Sea Turtle. We thoroughly enjoyed our stay. Wonderful location. Well furnished house. Beach was 1 minute down stair. Our family of three generations loved the house. Plenty of room for kids to roam. Kitchen is another plus. Ice maker and 2 fridges too. Perfect for us. Perfect start to the summer. This vacation home was absolutely perfect for our family of 11. The king size beds were great for our married couples and the bunk room was nice for our toddlers. Having beach access made getting to the water with 2 year olds, a breeze. The house was laid out very well- we were able to keep the toddlers downstairs, and yet give the newlyweds some privacy upstairs. Everything was clean and well maintained. We will definitely be staying here again!